Avoid shampoos and conditioners that contain sodium laurel sulfate, or sodium laureth sulfate. These harsh, stripping chemicals also known as (SLS), are synthetic detergents that are used in dishwashing liquid and other cleansers. They are valued because they lather well, but they are very harsh, can dry out your hair and strip your hair of essential oils and cause alot of damage to the hair. Instead, look for shampoos and conditioners made without SLS and parabens which are very gentle. Try WEN Cleansing Conditioner . WEN is an all natural cleansing conditioner that cleans and conditions the hair at the same time and is made with all natural ingredients and essential oils, that won't strip your hair and will leave it feeling ultra smooth, soft and shiney! Use a hot oil treatment to deep condition your hair. Warm oil penetrates the hair shaft making the hair more flexible and giving it shine. This can also help to prevent split ends which result from dry hair. You can make a simple hot oil treatment by warming up a natural vegetable oil such as jojoba oil. Jojoba oil is actually a liquid wax that comes from a desert plant. It has a chemical makeup similar to the sebum produced by human skin. This quality makes it an excellent choice for natural hair care. Try Queen Helene Jojoba Hot Oil Treatment . It contains pure Jojoba oil which conditions & controls brittleness, breakage and split ends. Eat right and take multi-vitamins or a skin and hair vitamin. Several vitamins and minerals such as biotin, vitamin E, vitamin B, vitamin C and MSM, have been shown to help the hair grow. Try Deva Vegan Hair, Nails and Skin Vitamins . Their 100% vegan, gluten free and provide the necessary nutrients for healthy hair, nails and skin. If you are African American, or if you have curly hair, avoid brushing your hair. 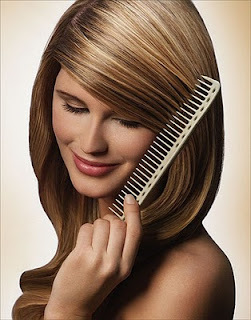 Use a wide toothed comb, or your fingers, to work with your hair. Brushes can destroy African American or extra curly hair by shearing it out of the scalp so style it when it's wet and let it airdry. Look for essential oils, herbs, and vegetable oils in hair care products. Essential oils such as rosemary, ylang-ylang and west indian bay help to stimulate hair growth. Lavender and tea tree and naturally antiseptic and help to fight dandruff. Vegetable oils such as soybean oil, safflower oil and corn oil are moisturizing and conditioning to the hair shaft. Try WEN Fig Cleansing Conditioner and WEN Bath, Body and Hair Oil which contain essential oils and smooth the hairshaft out. Another great all natural hair and body cleanser is Dr. Bronner Almond Hemp Pure Liquid Castile Soap . It's made with all natural oils so it's very moisturizing to skin and hair yet cleans effectively by dissolving dirt without drying out your skin or hair. You can this gentle cleanser on babies and it's moisturizing enough to use alone without conditioner. Avoid sleeping in hair accessories such as barrettes, scrunchies, head bands, etc. Wearing these kinds of accessories when sleeping puts unnecessary stress on the hair and can lead to hair damage. Massage your scalp to help stimulate hair growth. Massaging helps stimulate hair growth by increasing the blood flow to the scalp. This nourishes the hair roots and helps to stimulate the hair growth process. If your hair ends are damaged, give yourself a trim about every six to eight weeks to remove damage and split ends.